This time ten years ago, I was living in New Zealand. I was still getting to know the Kiwi, his multitudinous family and a whole new country, I was also recovering from a fractured skull – never mess with Auckland courier trucks! – and looking for a lot of missing words. And that, with a lot of help from Susan, aka The Techie, was the beginning of Bibliocook. That was ten years ago. That was [deep breath], a return to Ireland, marriage, move to the country. two children and a brewery ago. As I cautiously dipped my toe into this new world of blogging back in March 2005, I had no idea how it would change my life, that I would still be doing it a decade later – and how many amazing people it would put me in contact with, both online and in the real world. One of the first “real” people (you couldn’t count family and friends!) to leave a comment on my blog was Barbara Harris of Winos and Foodies, a shining light on the then tiny NZ blogging scene. Barbara became one of my first online friends, introducing me to the world of memes and lemonade scones, Darling Bakers and writers like Gay Bilson, Donna Hay and Lois Daish. Barbara started her blog when she was undergoing treatment for cancer, writing about her AC (after cancer) life with inspiring zest and and I was greatly saddened to learn of her death in 2012. Her warmth, writing and recipes live on. This is a recipe that always makes me think of her. In a large bowl, whisk the flours together with the sugar, salt and dried yeast. Making a well in the centre, pour in the warm water and milk and mix well together, using your hand. Knead the dough in the bowl for at least 5 minutes, until smooth. This is a sticky dough so don’t try to answer any phone calls. You may, of course, use a stand mixer with a dough hook – or even make the dough in a bread machine. Cover the bowl with a damp tea towel and refrigerate overnight (or until it has doubled in size). Next morning, gently remove the dough from the bowl and cut into 8 pieces. Sprinkle a baking tray with plenty of cornmeal, drop the muffins on top and turn to coat well, shaping them into thick discs. Place another baking tray on top of the muffins and leave to rest for 20 minutes. In the meantime, heat a large frying pan – cast iron, if you have it – over a low heat. Cook four muffins at a moderate heat in the dry pan for 10 minutes until they are lightly coloured on the base. Flip them over and cook on the other side for another 10 minutes. Place the muffins on a dry tea towel and wrap to keep warm while cooking the other four muffins. Pull apart – never cut! – and eat with lots of butter while still warm. If you would like them in the style of What Katy Did Next, pull them apart, toast both sides and serve with plenty of butter and gooseberry jam. I can guarantee that you will enjoy them much better than Katy did at her first meal in England. Aww…thanks Lily! It’s been a great way of getting to know some pretty amazing people, like your good self and Alan. Life would have been very, very different without the motivation to keep on getting out there and meeting people. I’ll definitely drink to another ten years! 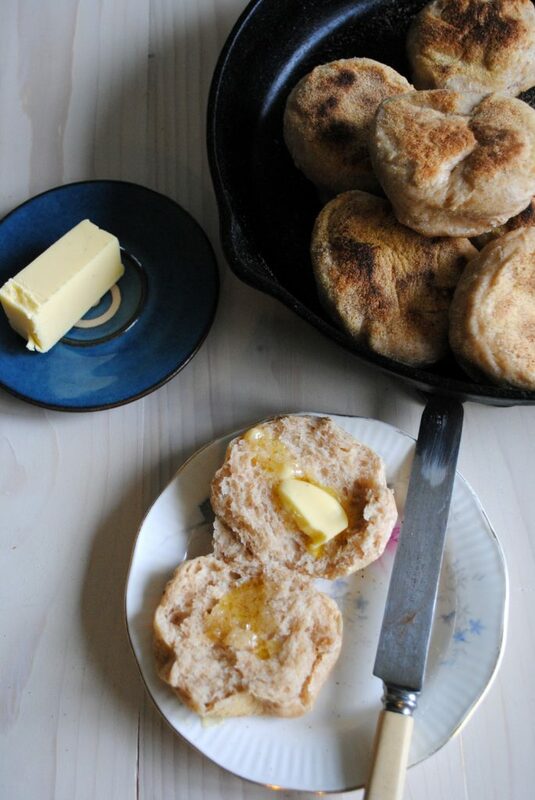 I’ve always wanted to try making English muffins because I love them with grape jelly or peanut butter. A quick go-to option in the morning. One of my favorite things is to make bread ahead of time and then vacuum seal and freeze it for when I have company. I get the vacuum seal bags from http://www.foodvacbags.com because they are way less expensive then the name brands (and I want to save money wherever I can!) 🙂 Thanks for this great recipe!!!! I just freeze muffins – or sliced bread – in regular freezer bags. Cheap and cheerful!